Black paper is wonderful! I love to do chalk drawings on black, and did a whole series of life drawings in a tiny little book I made, using black paper. Now you’ve made me want to do it again! Feels like you had a good time playing with these colours! With your love of the outdoors, Marie, I would think you could hardly keep from sketching a bit of that in a book! I also am hugely inspired by the Beauty outside. 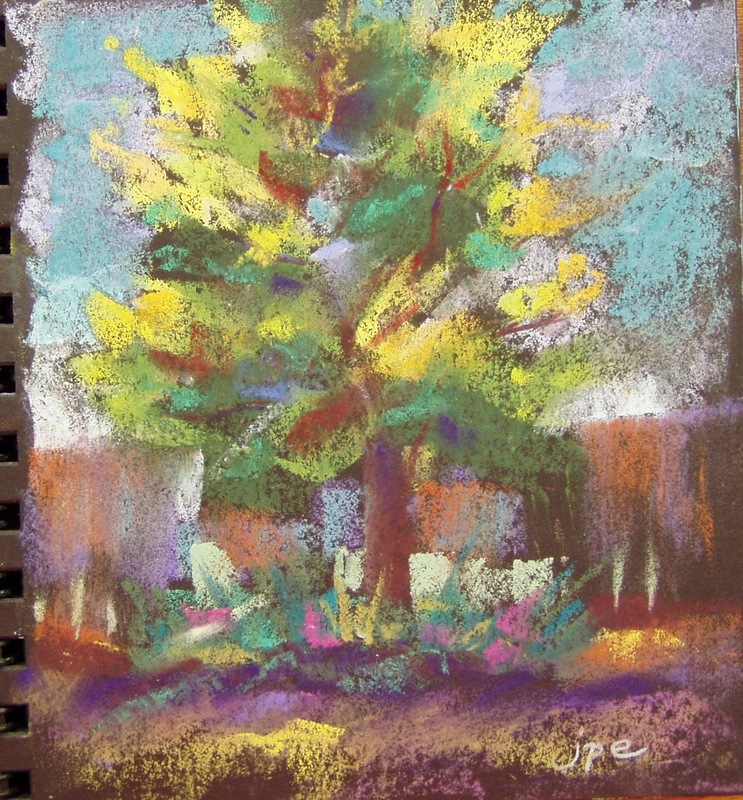 And though my drawings hardly come close to emulating it, they still allow me to enjoy nature on an even deeper level. Thank you for visiting and taking the time to comment!! “Little Black Books” reveal so much and WONDERFULLY so! You continue to amaze. Looks wonderful! 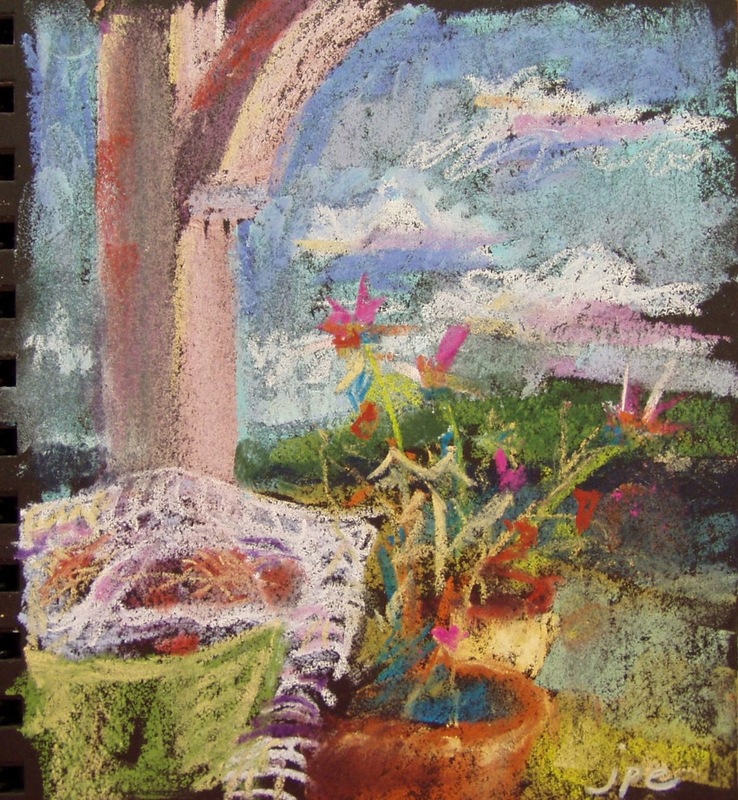 I’ve used soft pastels only a few times, and could hardly get any control out of it. But yours seem perfect! That Nike slogan is a good one for artists…just go for it! Sounds like a fab idea!! Somewhere I have a book with black paper. I was thinking of colored pencils when I bought it but I don’t think they show up well enough. I should look for it and try again. I think a book made from all these sketches would be a terrific gift! It would be super sitting on a table for others to look through and to realize they are looking at drawings of the very room they are in! How fun. Sounds like a lovely book, even more if it’s filled with artwork like this! wonderful work. i love it, especially that tree – its just bursting with life. A mother’s gift on Mother’s Day! God creates through a “woman brush” the most precious full size portrait ever.. A.LIFE. That you enjoy what you do comes screaming out of every post and through every piece of art. Hi Jennifer, Can you tell me what you put over your soft pastels so that they don’t rub off on each other when you close your book. I made myself a book out of Mi Teintes paper and am having great difficulty keeping the pages from rubbing off on one another. Hi Vicki! I actually try not to spray anything, and yes it does rub off some on the facing page. When I do spray, it’s either a cheap aerosol hair spray or an actual art fixative spray. These work fairly well, but they can also darken your image and you may feel you need to go over your picture again to brighten it. Either way though, there is some residual leftover on the facing page when you close the book. I’d LOVE to see your book you made…I’ve been wanting to make myself one also! Thanks for visiting!